Primitive spiders (Mygalomorphs): this group of spiders have 2 pairs of book-lungs on the underside of the abdomen and have chelicerae which work in an up and down fashion. They usually have 2 pairs of spinnerets, which feed out silk from the end of the abdomen. True or Modern spiders (Araneomorphs): this group of spiders have 1 pair of book-lungs on the underside of the abdomen and their chelicerae work from side-to-side. 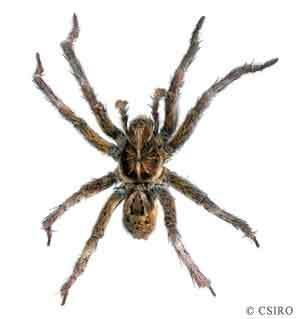 Most have 3 pairs of spinnerets and a spinning plate called a cribellum (although some species have lost this feature). Only after their final moult do male spiders become sexually mature. At this point they stop feeding and spend all their time and energy trying to find a female to mate with. When a mate is found the male spiders will transfer his sperm to the female via his syringe-like pedipalps. After mating the male will either die or be eaten by the female. A short time later the female will lay her eggs into a silken sac, which varies in shape and size depending on the species. Anywhere from a few up to hundreds of eggs may be laid in a single egg sac that she will usually guard from predators. On hatching the spiderlings resemble very small adults and are generally lighter in colour. The young may spend their first growth period within the egg sac after which they disperse, construct their own webs to catch food so they can feed and grow. Growth occurs by shedding their skin (moulting) in the same way as other arthropods and several moults are required before spiders reach adulthood. From egg to adult usually takes from 6 to 12 months, however some ground dwelling species may take up to 4 years to reach sexual maturity. 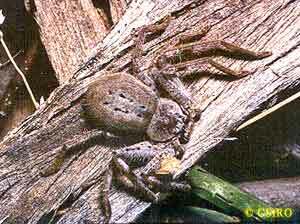 Most species of spider are active at night and all are predatory, feeding on a wide range of other invertebrates. Cannibalism may also occur among spiders especially where there is overcrowding. Different species of spiders use a variety of methods to capture their prey, but most usually construct sticky silk webs or threads to trap potential prey. Other species chase their prey often capturing them with rapid lunges. The venom that spiders produce is predominantly used to kill or immobilise their prey by being injected through hollow fangs into the captured animal. The prey is then squeezed or held by the strong basal section of the fangs and saliva in the spiders upper lip digests the body contents. The insides of the victim are then consumed and the hard outer body discarded. Spiders are found in all terrestrial habitats across Australia and some have even adapted to a semi-aquatic lifestyle. They are common inhabitants of almost every kind of habitat and may be found in all types of forest environments from moist tropical rainforests to dry Eucalyptus forest and woodland, they are common in scrubland, desert regions, caves and around human habitation. Spiders can commonly be found in leaf litter and under rocks, logs or the bark of trees. Many dig burrows in the soil while others spin distinctive webs amongst vegetation. For more information on some of the more common spiders see the CSIRO Entomology Identification and Advice Service page on spiders.